This is a beautiful slinky jacket or duster, available in roomy sizes Lg to 9x. 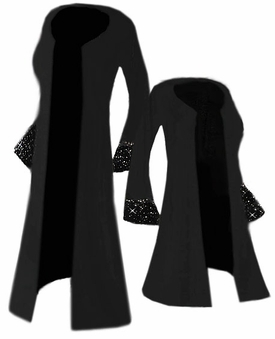 It is a gorgeous black stretchy material with scattered rhinestone detail on the bell sleeves (also has an option to add scattered stones around the bottom of the jacket as well - extra charge, special order!). It is an open jacket, with no buttons or closure; it is meant to be worn open. Very pretty! The picture doesn't do it justice! You can choose to have it made in either a comfy casual poly/cotton jersey stretch material (like t-shirt material), or in slinky material, which is a very stretchy blend of poly/lycra. OR NEW! Shimmering yummy soft black stretchy smooth velvet (our favorite!)! You also have the option to choose the length, the standard length is 36", but can be special ordered extra long or extra short!